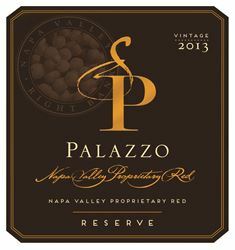 PALAZZO WINE - Scott Palazzo is a man who follows his passions - and in the process, invites everyone he meets to come along for the ride! Creative, energetic, & fervent in his convictions, Scott came to the wine world with a vision formed by both his Italian heritage and his artistic sensibility. Raised in an Italian household, Scott grew up with wine as a backdrop for life’s everyday events, meals, and celebrations. An artist at heart … and a rolling stone by nature, his path to becoming one of the top winemakers in Napa Valley took many twists and turns. At age 19, a summer trip to France evolved into a three-year extended stay. With his guitar on his back, Scott wandered into the small winemaking village of Saint Émilion (on the Right Bank of Bordeaux’s Gironde river) and quickly fell in love with the people, the land, & most of all, the wines. This experience shaped his palate and served as inspiration for the establishment of Palazzo Wine 20+ years later. In 2003, after establishing a successful career as a Grammy Nominated Music Video & Television Director / Producer, Scott began exploring California’s wine regions with a new creative undertaking in mind ~ producing a beautifully refined, terroir-driven wine like those he had discovered in Saint Émilion. His search led him to the Carneros Appellation in Napa Valley, where the similarities between the rolling hills of this South-of-Napa Appellation and those of Saint Émilion convinced him that this was the right location to create his wine. The maritime climate and shallow clay soils of Carneros were ideal for achieving his goal to produce a wine with wonderful layers of rich fruit, balanced by elegant acidity … like those he’d grown to love while living & working in Bordeaux. Sourcing fruit from some of the most celebrated hillside vineyards in Carneros, Palazzo has realized his dream of producing world-class wines, combining new world fruit with an old-world sensibility in the cellar. Scott Palazzo’s wines have been accepted and embraced by some of the wine world’s most respected and influential restaurants, sommeliers, and critics from all over the United States. The French Laundry, Gary Danko, Michael Mina, Per Se, Daniel, Gramercy Tavern, Spago, Bouchon, Charlie Palmer Steak, Emeril’s, Valintino’s … are just a few of the country’s prestigious restaurants offering Palazzo Wine. Scott Palazzo makes wines that are beautiful & complex … with wonderful layers of rich fruit and texture on the palate! Delicious food wines with both ‘power & elegance’ … from the Carneros District in Napa Valley. Saint Emilion and Pomerol … meet Carneros / Napa Valley Hillside Fruit!